As a Landscape Foreman, I supervise a crew who does new landscape installations as well as updating of existing landscapes. We do everything you can imagine and more! 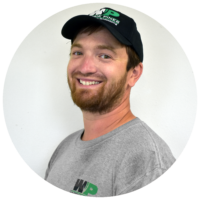 Most of my experience landscaping comes from learning on the job at Wapsie Pines. I am a hard worker and a team player and have worked my way to becoming a Foreman. My favorite part of my job is seeing the daily progress of a landscape project. Finally seeing the finished project gives you a great feeling of accomplishment. Client’s often don’t water new plants long enough. New plants need to be watered until established which could be a couple of weeks or more in the summer. If it’s extremely hot and windy, that could mean watering a couple of times a day. I like to be outside fishing, grilling, relaxing, and trying new beers at our local breweries!